The service list on the right are the services that AAACT listed on its website as providing at the time of its demise. With the arrival of the NDIS in the ACT, the AAACT Committee decided to move the organisation from its origins, a volunteer organisation doing its best to support autistic people and their families, to become a service provision organisation. Sadly, due to some unwise choices, AAACT was for a considerable time unable to contain its costs within its income. Both the ACT Government and the NDIS have also contributed to the demise of AAACT. They simply don't understand autism … and they have little regard for the distinct nature of specific disability types. They were/are looking for the simple “silver bullet” solutions in the disability sector. Unfortunately, they don't understand that installing wheelchair ramps everywhere does not give autistic people access to mainstream and disability services that they need. Both the ACT Government and the NDIS support (fund and prefer) generic disability services that do not understand and recognise the distinct needs of autistic people and their families. Governments and the NDIS are driven by ideology that has very poor regard for, and is sometimes contrary to, the practical needs of autistic people. At the recent AAACT meeting, the autism community was told that AAACT has never been “NDIS accredited”. This shows that AAACT, the ACT Government and the NDIS just didn't get their “acts together” in respect of autistic clients and their families. The Canberra Times article says “Marymead chief executive Camilla Rowland says the continuation of autism-specific early intervention is vitally important”. But Early Intervention isn't listed among AAACT's services … Marymead may be disappointed if it expects to acquire a fully functioning Early Intervention service for autistic children. Marymead will need to provide Early Intervention for autistic children that the NDIS will fund. The NDIS's Early Intervention approach is very different from the previous HCWA model: it is an untried approach that is not evidence based in respect of severely affected (the majority of those diagnosed) autistic children. Generally, the ASD community appreciates Marymead for stepping in to maintain a group focused on ASD services. But that only meets part of the need. 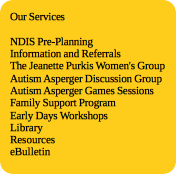 Before its demise, AAACT dropped out of providing several valuable but unfunded (community supported) services. The ASD community in the ACT may decide to restore those services. And SOfASD will continue its role advocating for autistic people and other people living with autism in the ACT.